I've searched all over the internet, and I can not find any information about integrated circuit of the hitec hs-311 servo. I know only that the circuit has to do with the H-bridge. Can somebody help me for this problem? Take a read of this page. It will explain what signal the servo requires. or this about the block diagram of a typical servo motor unit. I've searched all over the internet, and I can not find any information about integrated circuit of the hitec hs-311 servo. 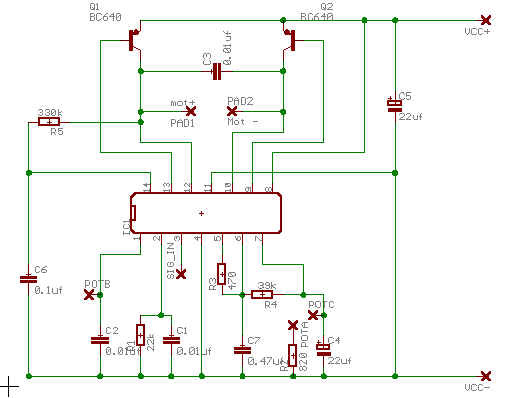 But I have found schematic like this but i only need the schematic for the hs 311. The HS311 using proprietary integrated circuit HT7002, I don't think you can get the schematic or any info for it, unless you trace the circuits yourself. another ways was to ask HiTec for the info. Here is an internal servo schematic of the regular HSR-5995TG servo provided by another tinkerer, Richard Ibbotson. He traced the circuits himself.